The Disney Visa credit card is an option available to save money on and for a Disney vacation. It offers 1% return on everything charged to the card in Disney Dream Reward Dollars which can be spent for anything at the parks, resorts, Disney Cruise Line, and even the Disney Store. It also offers 10 – 15% deductions on some things at the parks, resorts, or ship. I will list these later. So, is it a good option? The resounding answer is….maybe, sometimes. Allow me to try to explain. For a rewards credit card, 1% return is not very generous. If your current card offers no rewards, then obviously, this is better. “A penny saved is a penny earned.” That is exactly what you get with the Disney Visa. On the plus side, it is a 1% return on ALL, not just select, purchases. For example, the Target Visa offers 5% off purchases from Target. We get most of our groceries and household items from Target; so, the Target Visa is a much better deal to use there. It gives no rewards on gas, dining out, park tickets, or reservations. So, it is not good to use at those times. We usually keep two cards. I do not like to have more than two cards, because it can become very confusing quickly. No matter how generous the “rewards,” the APR financing for credit cards are horrible. So, no credit card is a good idea if you do not pay if off on time, every time. Having too many cards and forgetting a payment negates any benefit. For quite some time, we kept the Disney Visa as our secondary card to use on anything not from Target. It worked well. Perdita has since changed to an another one which fits our current situation better. Another instance in which it may be a good option is if you have a hard time setting money aside specifically for Disney, and you want spending money for a Disney vacation. Disney is the only place that the Reward Dollars can be spent. Now, let’s look at how much you will have to charge to “pay” for things at the parks. Let’s say that you use your card for gasoline only, like the “average” American, you drive 13,500 miles per year, your car averages 25 miles per gallon and gas costs $2.50 per gallon. That comes out to 540 gallons, $1,350 spent, and $13.50 Disney Dream Reward Dollars. This will buy you a quick service meal with dessert or a refillable mug. Most of us will use it for much more than just gas, like dining out, park tickets, and reservations. $10,000 charged = $100 DRD = 1 day admission to Magic Kingdom. Every little bit does help, though. Another potential money saving role of the Disney Visa is for purchases only for the Disney Vacation. You can sometimes (rarely) get discounts on tickets and reservations. You just have to watch closely. 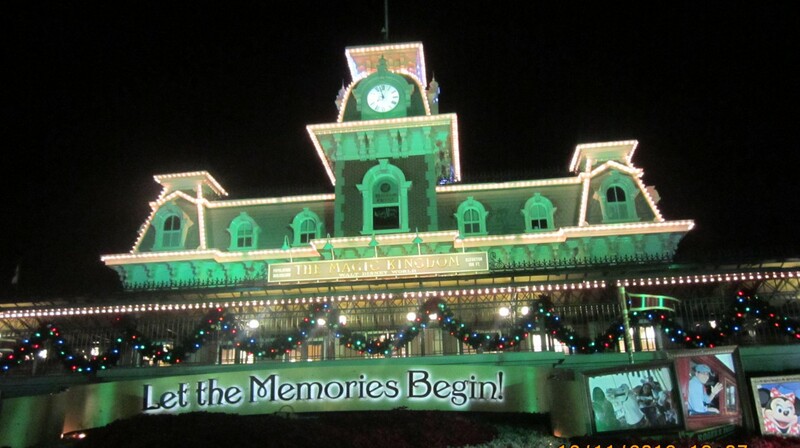 They due offer 0% APR for 6 months off of large Disney purchases like vacation packages, cruises, and DVC purchases. It also offers discounts at many, but not all, shops in the parks and resorts. Saving 10% on souvenir purchases and the “free” character photo may be worth it. If you are an annual pass holder or a Disney Vacation Club (DVC) member, then you already have similar, but better perks; so, it really does not make sense for you. Again, is the Disney Visa a good money saving option? I will stick with my prior answer, “sometimes, maybe.” You will have to decide for yourself. I will list the benefits below to help. 1% in Disney Dream Reward Dollars on all card purchases. 0% APR for 6 months on select Disney vacation packages, cruises, Adventures by Disney trips, and Aulani resort. 0% APR for 6 months on purchase of DVC membership, including member add on. This does not include purchases on the resale market. $50 onboard credit aboard a Disney Cruise Line vessel when purchased in full with the Disney Visa. Free 5 x 7 character photo from 1 – 7 p.m. daily at Innoventions West in Epcot at WDW and from 10:30 – 1:30 daily at Blue Sky Cellars in Disney’s California Adventure in California. 10% off select purchases of $50 or more at most, but not all shops, at WDW, Disneyland, and DVC resorts including Aulani, Vero Beach, and HHI. In general, the large stores selling Disney merchandise, like Mousegears in Epcot, will give the discount. 15% off select tours and experiences: (Magic Kingdom) Disney’s Family Magic Tour, Disney’s Keys to the Kingdom Tour, Disney’s The Magic Behind Our Steam Trains Tour; (Epcot) Gardens of the World, The UnDISCOVERed Future World, Disney’s Dolphins in Depth, Epcot DiveQuest, Epcot Seas Aqua Tour, Behind the Seeds; (multiple WDW parks) Backstage Magic, Disney’s Holiday D-Light Tour at Christmas, Disney’s Yuletide Fantasy at Christmas; (Fort Wilderness) Wilderness Back Trail Adventure and Horseback rides; (Port Orleans and Fort Wilderness) carriage rides; (WDW Deluxe Resorts) spa treatments of $45 or more; (Disneyland) Welcome to Disneyland, Discover the Magic, Cultivating the Magic. 10% off certain California Downtown Disney establishments: Jazz Kitchen, Wentzel’s Pretzels, RIDEMAKERZ, Alamo Rent A Car, ESPN Zone. 15% off purchases from littlemissmatched in California Downtown Disney. Eating “Cheaply” at Walt Disney World. I always want to come here to eat when we come to EPCOT. They have great Mexican food and nice inside seating. For food, we eat at the quick service restaurants at the parks and at the Contempo Cafe at The Contemporary Resort. We stay at the Bay Lake Tower a lot and the Contempo Cafe has reasonable prices and good selection with some nutritious choices. We have stayed at other resorts and found their quick service restaurants pretty good and usually more relaxed than at the parks. 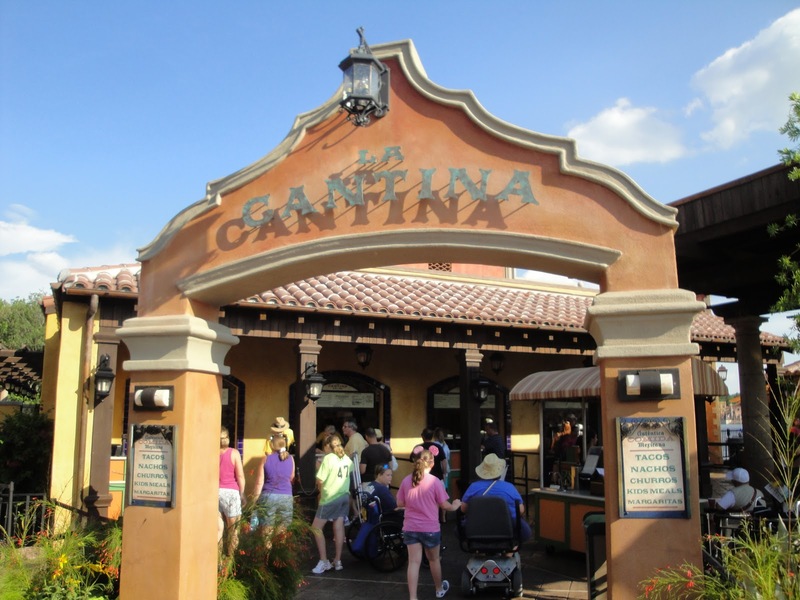 At Epcot there are many quick service options that are both reasonable in price and filling and good. At the Land in Epcot there is the Sunshine Seasons restaurant that has 5 food choices like a mini-food court. The Mexico Pavillion and many of the countries offer good food at reasonable prices. 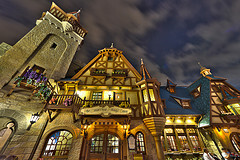 This is the Pinnochio Village Haus, my favorite restaraunt in Magic Kingdom. They serve some of the best flatbreads in all the parks. At Magic Kingdom both Ray’s Starlight Cafe and Pinocchio’s Village Haus have good choices for about $10/ person per adult and less for kid’s meals. Ray’s has a huge 1/2 roasted chicken meal with great mashed potatoes and green beans for $10.99. ( We buy two meals and get an extra plate and feed all three of us). Ray’s has 3 food choices with different lines; one for chicken, one for sandwiches and burgers, and one for soups and salads. At Animal Kingdom Flame Tree Barbecue is good and not too expensive. Pizzafari is okay but nothing special. 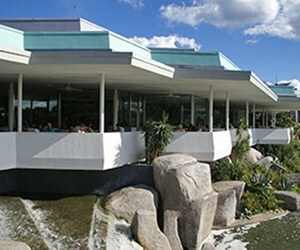 Cosmic Ray’s Starlight Cafe. From the seating area pictured here you have a great view of the fireworks. Hollywood Studios has a dearth of quick service options. What is there is sub-par in my opinion. If you fly with Southwest, you can check two bags for free. This leads to another way to save. Pack an entire suitcase full of snacks and food. We did this for Christmas and saved money this way, especially since we like to snack quite a bit. In summary, eating cheaply at Disney World isn’t possible but eating cheaper is. Refillable mugs are available at all WDW resorts. The mugs can be filled at any resort, but not at the parks. If you have a “meal plan,” then it is included in your cost. For others,the cost is as follows: $8.99 for 1 day use 11.99 for 2 days 14.99 for 3 day 17.99 for length of stay (up to 14 days) The “days” are calendar days, not 24 hour periods. They can used for hot coffee, hot tea, hot cocoa, iced tea, and fountain drinks, which usually include lemonade and a sports drink. Juices, alcoholic beverages, and speciality drinks like cappuccino are not included. Just looking at the costs, it seems costly, but it actually can be a cost conscious purchase. Whether or not the mugs are a good deal, depends on the person and family. The cheapest drink option, of course, is water which available free of charge at the resorts and parks. Florida tap water tastes like the swamp from where it comes, though. It is really nasty. Flavoring packets can added to the swamp water and are another cost effective option. Shops such as the Dollar Tree sell packs of 10 for as little a $1, and these can easily be fitted into luggage, taking minimal space. If you are driving, you can take whatever beverage you like into your room. If you are staying in a moderate or deluxe resort, coffee to make up to 4 cups are placed in your room each day. This occurs twice per week at DVC resorts. Budget resorts do not offer coffee makers, so, coffee is an additional cost. These are some other ways which affect the value. For our family, it makes sense. Perdita and Roly shun even the best tap water. We always fill them for breakfast at the resort. Then we refill them for mornings at the park. We usually come back to our room in the afternoon for a siesta, and refill again. They are refilled again heading out for our evening at the parks. Finally, they are refilled before we retire to the room for the night. We rarely even buy a drink at the parks, other than an occasional LeFou’s Brew. That amounts to 5 fills per day, 35 for an entire week. The longer you stay, the more of a value they are. After using them for a week, we are paying roughly $.50 per drink.. This is not bad and is close to what you will pay if you bring in canned drinks. It is much cheaper than buying drinks at WDW and/or the resorts. Another consideration is the mug itself. They are great souvenirs. I use one every day during my commute to work. You are paying basically $6 for the mug, similar to the price of a pin, but something that can actually be useful when you leave the park. * refillable mugs are also available and similarly priced at Disney’s Aulani, Vero Beach, and Hilton Head resorts, but not at any of the California resorts. Final thoughts: 1. Water is the cheapest option, but Florida water tastes bad. 2. If you have access to a car, there are other options that can save more money. 3. If you buy more than 1 drink per day at a resort, then the refillable mugs offer a good value, and you leave with a useful souvenir. My favorite cool weather mug recipe: – fill the mug a little over half full with decaf coffee – hot cocoa to about a 1/2 inch from the top – top off with a 1/2 inch of cream – stir well (tasty and a lot cheaper then Starbucks) Pongo.